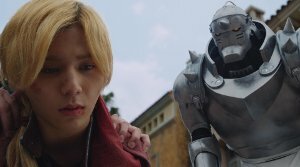 Story: In a world of alchemy, where objects can be changed in form and shape, Edward (Ryosuke Yamada) is well known as the Fullmetal Alchemist. He works for the government but his real goal is to find a way to give his brother Alphonse his body back. As little children, the two brothers tried to resurrect their deceased mother by using alchemy. Alph died in the process. Edward lost an arm trying to save his mother and sacrificed a leg to bring back his brother's soul. Ever since Alph is stuck in a metal armor and Ed replaced his missing limbs with metal ones. Because of that, the young man is called Fullmetal Alchemist. Soon he hears about the philosopher's stone, which is supposed to provide extraordinary alchemistic powers. Searching for it, he comes across a doctor, who has done some experiments for the government. But before Ed manages to get some information from him, a Homunculus, an artificially designed human being, called Lust (Yasuko Matsuyuki) turns up and kills him. Who does Lust work for and is there some kind of government conspiracy? 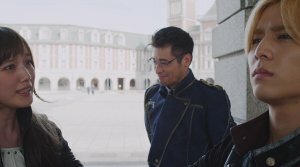 The Fullmetal Alchemist gets help from a friend in the military, Hughes (Ryuta Sato), but he still asks himself who he can really trust. Review: Let's make it short and sweet. For ten years now, the anime series "Fullmetal Alchemist" is on my to-watch-list. But I never came around to it. In the meantime, Warner Bros. and Netflix managed to get a live-action-adaptation going. It is colorful, partly epic and seems to use a lot of the original's elements. However, this is exactly where the movie's weaknesses lie. It is not really an adaptation, but rather a direct movie version of the anime. 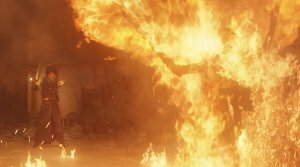 Therefore, the action movie comes across a little bit comic-like and sometimes even ridiculous. This may be fun but you also realize that beneath the mind candy there is some depth hidden in there somewhere, only it cannot really take effect. The atmosphere of the depicted world really stands out positively, though. The story takes place in an European city at the beginning of the 20th century - the movie was shot in Italy - and the background music is cheerful, giving off a fantasy/medieval vibe. We get interested in this alternative universe, in which we find magic in form of alchemy. At the movie's core lies the two brothers' tragic story, which gets lost because we are not really emotionally bound to the characters. In fact, the movie takes a lot of time to show the relationship between the two, but the mediocre dialogue and the erratic script fail to build up the foundation to make us get close to Ed's guilt-ridden feelings. 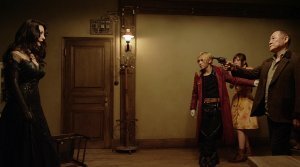 There is a scuffle between the two brothers, a small well-done scene, which shows us that the movie could have done more in that department. As far as I can tell, the movie tried to stay close to the plot of the original manga but supposedly did not adopt quite that much of the story's character portrayal. In my opinion, "Fullmetal Alchemist" has too many characters. But they are only created as flat characters who get a few seconds in the limelight so that people not knowing the original understand that they must be important characters of the manga. But apart from being fan service, this does not help the movie at all. It would have been better if the filmmakers had given characters like Roy more room, as he becomes the focus of attention far too late. Instead, we get Winry, who - especially at the beginning - is extremely hyped-up and gets annoying rather quickly, particularly as she is responsible for some awkward scenes, which make the movie and its humor seem cheap. Our villain, Lust, could have used some more room within the story, as well, because her motives basically stay in the dark. Ryosuke Yamada ("Assassination Classroom"), as the main character, does not manage to charm us either. Something is missing and so you just cannot completely immerge into the movie's world. The general outline of the plot might be easy to understand but there are political entanglements which only get hinted at and show a complexity which most likely is just supposed to be a reference to the original. Instead of a deeper understanding of the civil war's background or the rebellion, we get villains who explain their plans for minutes on end while troops of soldiers surround them and for some reason never use their chance to pull the trigger. Or there are people who presumably want to help our heroes only to later quite obviously reveal themselves as traitors. The script will certainly not win any awards. 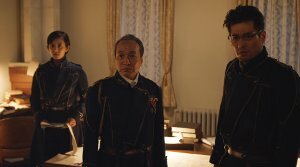 Director Fumihiko Sori ("Ichi") does not manage to keep things firmly under control. His version of the original slips away from him too often. Scenes of uncomfortable silence show us that he does not have the right sense for timing; in the end there is always something happening but the 135 minutes running time could have been used more sensible. The action sequences impress with special effects, which - apart from some ridiculous seeming monsters at the end - are rather convincing and are just fun to watch. Even though sometimes it tries to stick too close to the original and therefore it's just a tad too much. In the end, "Fullmetal Alchemist" is another example for well-done manga adaptations being really rare. As an appetizer for the original, in which you can expect a complex world with fleshed out characters, this movie might work out but fails on all other levels. Especially, because we don't get interested in the characters, you'll quickly forget this flick.